Regular readers will have noticed that I tend to enjoy reviewing films and books from what I consider the golden age of spy fiction – that is, the 1960s. I have nothing against modern hi-tech thrillers, but I relish the days when the world was not so complicated. But it sure was dangerous, and characters had to live by their wits. Spy stories from the 60s can blast you back to a time before political correctness. Drinking, smoking and a vigorous bout of bedroom acrobatics presented no danger to the population in those days. In fact a good spy would smoke at least two packs a day, down a good bottle of scotch, and then go to bed with a beautiful, willing sexual partner. But by the time the late seventies and eighties rolled around, the world had changed quite considerably. Now forty years down the track, the 60s almost seems like an alien landscape. Now I am not the only one who enjoys time-traveling back to the sixties. Another fellow traveller is Jeremy Duns. Spy novel fans may be familiar with Jeremy, as he is the moderator on the Yahoo Spynovels discussion group. His knowledge on vintage spy thrillers is second to none, and it comes as no surprise that he’d turn his hand to writing an espionage novel. His first, Free Agent is being released early next month in the UK, and follows in the US in June. In July 1945, MI6 agent Paul Dark took part in a clandestine mission to hunt down and execute Nazi war criminals. He will discover that everything he understood about that mission, about its consequences, and about the woman he once loved, has been built on false foundations. Now it’s 1969, and a KGB colonel called Slavin has walked into the British High Comission in Lagos, Nigeria, and announced that he wants to defect. His credentials as a defector are good: he has highly suggestive information indicating that there is yet another double agent within MI6, which would be a devastating blow to an organisation still coming to terms with its betrayal by Kim Philby and the rest of the Cambridge ring. In typical Cold War fashion, I thought I’d lock Jeremy in a darkened concrete bunker, shine a bright light into his eyes and force him to submit to a thorough interrogation. 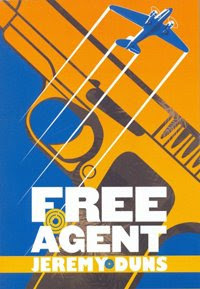 DF: Congratulations on the publication of Free Agent. I can’t wait to get my grubby mitts on a copy. As I stated in my intro, I am quite fond of spy stories from the 60s, but why did you choose to set your story in that decade? JD: I’m a fan of spy stories in general, but I do tend to gravitate towards those set in the Cold War. Something about the atmosphere of the time draws me in. I lived in Belgium for many years, and for some reason the second-hand bookshops there were filled with paperback spy novels, and I just started devouring them. I discovered a lot of forgotten but, in my view, fantastic writing from that period. When I eventually started thinking of writing my own spy thriller, I knew I wanted to set it in the Cold War, because for me that was the golden age of the genre, and I thought it could be revisited from a fresh angle. The Sixties are a fascinating decade, but the focus is often on the same things: Vietnam, Woodstock, JFK and so on. I thought there was room to look at more. Free Agent is set during the Biafran war, which has faded from many people’s memories, but was as big news at the time as Vietnam. DF: Elsewhere you’ve mentioned that Derek Marlowe’s book, A Dandy In Aspic was one of your inspirations – how would you compare Paul Dark and Alexander Eberlin, from Dandy? JD: Well, Eberlin is Russian, a deep-cover Soviet mole. My character, Paul Dark, is British, and was essentially the victim of a honey-trap operation, as a result of which he became a Soviet agent, he thought, for ideological reasons. He’s more akin to the members of the Cambridge Ring in that sense: a ‘high-born’ Englishman. If you want to get down to it, he’s a traitor, and Eberlin isn’t. But Eberlin is a rather unsympathetic character, I find, a cold and arrogant man, with a fondness for fancy clothes and fine food. Part of the pleasure of that novel is seeing the cocky dandy dangling so close to the aspic. But Free Agent is a first-person narrative, so we see everything through Dark’s eyes. He’s also unsympathetic in some ways, but hopefully readers will feel some empathy with him, and with the situation he’s in. Eberlin simply wants to go back to the Soviet Union. That’s not an option Paul Dark wants to pursue: he’s made an enormous mistake, which he can’t undo, and he’s now on the run for his life. DF: Are there any other major influences that will be apparent to fans of spy fiction? JD: A Dandy In Aspic was a major influence simply because it’s one of the few spy novels I’m aware of that has a double agent as a protagonist. Another is Graham Greene’s The Human Factor. So I looked at both of those books, and hopefully learned from them. The Bourne films with Matt Damon were also an influence, because I think they reminded people that adrenalin-pumping suspense could be well-written and intelligently crafted. Perhaps the most obvious influences, though, are Len Deighton, Frederick Forsyth and Elleston Trevor (mainly for the Quiller series, which he wrote under the name Adam Hall). I was influenced by a lot of writers, in fact, but hopefully it has its own distinct flavour. DF: Like all good spy stories, Free Agent appears to feature a fair bit of globetrotting. Did you visit the locations featured in the book? JD: I spent around five years in Nigeria as a child – my father worked there. We left when I was rather young, but I still have very vivid sense memories of it and tapped into those. Because Free Agent is set in 1969, four years before I was born, I didn’t think it would help to revisit, because I really wanted to make it feel like the action was taking place in that time and was worried I might confuse matters for myself. I spent about a year researching the book, reading dozens of accounts of the war, looking at photographs and footage from it and so on. London is the other main location, and I have lived there, but that too has obviously changed a great deal since 1969 and again I read a lot of guidebooks and magazines and articles from the time. For the episodes in Germany in 1945, I read several books about the SAS and one in particular about their work tracking Nazi war criminals – The Secret Hunters by Anthony Kemp – and I also managed to interview a couple of SAS veterans who had been involved in that – although in a very different way than happens in the novel! DF: You’re a bit of a globetrotter yourself though; growing up in Africa and Asia, and now residing in Sweden. Do you think that your jetsetting lifestyle has prepared you for a life as a thriller writer? JD: I wouldn’t class myself as a jetsetter at all, but growing up in several countries has given me some curiosity about other cultures, and I think I’m generally quite a Curious George, perhaps as a result of my upbringing. When my ideas for Free Agent were taking shape, I considered several locations, and the fact that I had lived in Nigeria did influence my decision to set it there. I remembered my parents having books on their shelves about the Biafran War, and became curious about it – they gave me a lot of amazing material, in fact. We lived for several years in Malaysia, and my mother asked me a few days ago when I was going to set a book there. Maybe, one day! DF: Since I have got you under the spotlight, I am not going to shy away from asking the tough questions: In the US, your book is already courting controversy. Free Agent has been identified in The Running Man copycat cover conspiracy. Well, I’m calling it a conspiracy – The Rap Sheet recently ran a post highlighting the use of the same image on five book covers, Free Agent included. So do you prefer the UK or the US cover? JD: Oooh, that is controversial! Do you want me to annoy my American editor, or my British one, David? I like them both, of course. The American cover has changed a little, in fact, although that man is still running in the centre of it. I was already aware of both Robert Ferrigno’s cover and Dead Men’s Dust, because Matt Hilton and I are both members of the International Thriller Writers’ debut group and we both spotted it at once. I think this happens a lot these days, to well-known writers as well as those starting out, and I can understand why: it would be very expensive and time-consuming to create photographs from scratch for every book. And I do love the texture and atmosphere of the photograph. I think the British cover is a very cool, very fresh take on a Sixties-style cover, and I loved it the moment I saw it. But there are all sorts of considerations that the publishers have to bear in mind, and I trust that they know what they’re doing. It’s their job, after all. DF: Although not politically correct today, Ian Fleming once remarked that he wrote for ‘warm-blooded heterosexuals in railway trains, aeroplanes or beds’. Who do you write for? JD: Cold-blooded transsexuals on hydrofoils only, please. Anyone else, just don’t bother with my book! Seriously, I write for as broad an audience as I can. I want people who don’t usually read thrillers to read my work, and hope that pretty much anyone over the age of fourteen or so could enjoy Free Agent. DF: And one final question, completely unrelated, which I ask all interviewees – Are you a Bond man or a Bourne man? JD: Thank you – and keep up the great work with the site. 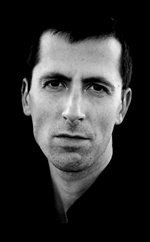 Jeremy Duns was born in 1973 and grew up mainly in Africa and Asia. He read English literature at St. Catherine’s College, Oxford, after which he worked as a journalist in Brussels for seven years. His debut novel Free Agent, the first of a trilogy of spy thrillers set in the Cold War, will be published in the UK on the 5th of May and in the US on the 25th June. The Dark Age begins soon.